Gently soften the chopped white onion in the butter. Add the torn rind of the confit lemons. Cook until they start to fall apart, pour in the cream, cook for 5 minutes and mix until you obtain a nice fluid cream; add salt to taste. Cook the whole beetroots with the skin in a steam oven; when cooked, peel them and blend them finely, add the balsamic vinegar and a drizzle of olive oil; add salt to taste. Cut some very fine slices of "Buddha's hand" lemon and blanch to soften them. Cut the celeriac into round slices and glaze them in the butter. Place a small amount of beetroot mousseline sauce in the middle of the plate and lay the celeriac round on top of it; trace a teardrop of lemon cream by the side and drop a few bitter cress leaves onto it. Toss the scallops in the frying pan with a little olive oil and dress them with the unrefined salt. 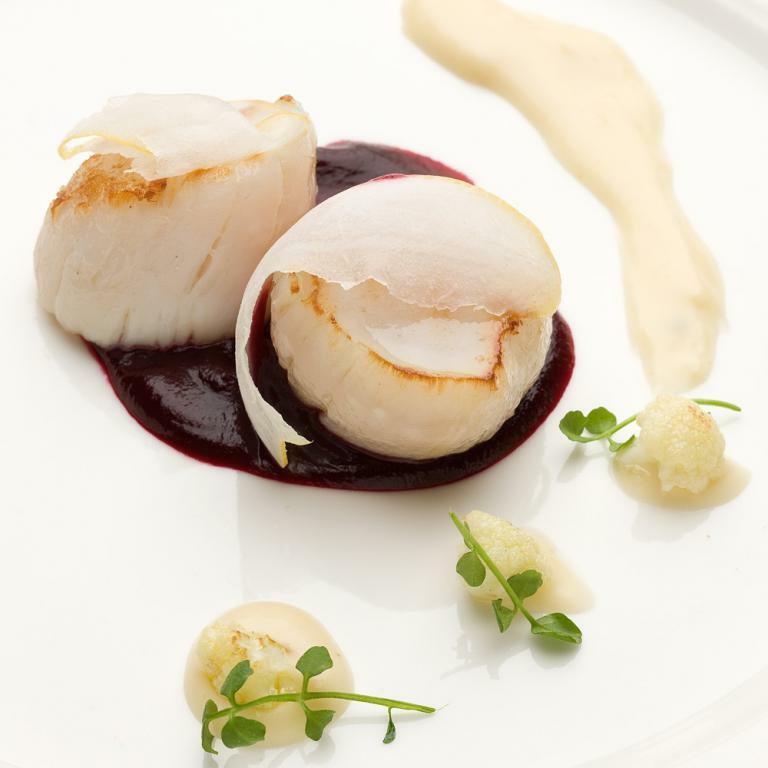 Place the scallop on the celeriac with the fine slice of lemon by the side.